MIR’s Raging Bike Fest Delivers! 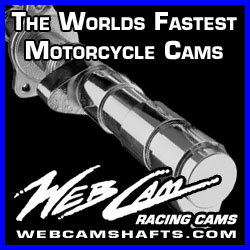 Like the postman, Maryland International Raceway‘s WPGC Bike Fest always delivers the goods. 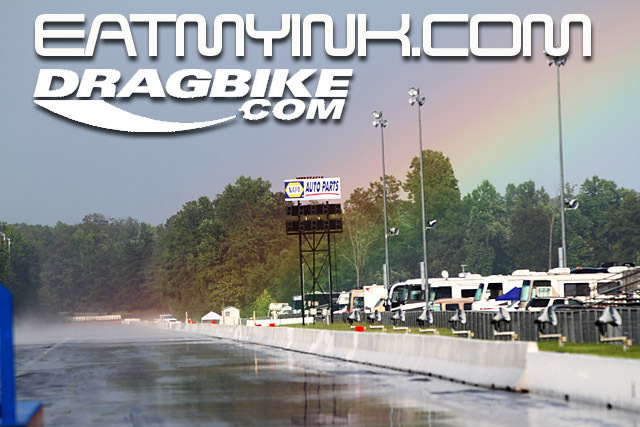 A rain shower on Saturday only served to cool the racing surface for the world’s quickest streetbikes of the Mickey Thompson MIRock Superbike Series. 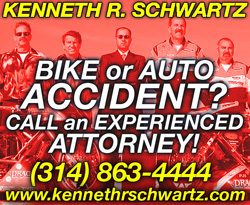 By the time another shower fell Sunday night, nearly all racing was complete and the bike club, stunt, music, culture and lifestyle events that are hallmarks of the Bike Fest were in under the wire. Orient Express Pro Street boiled down to a final round match-up between three-peat champ Rodney Williford and points leader Joey Gladstone. Williford’s own bike is getting revamped, so he was once again racing the Roger Starrette owned “No Joke” Haybusa in the day and testing Maltese racer Simon Giordmaina’s bike at night. Williford raced his way to the final, while with two broke byes and one earned, Gladstone waltzed in without ever facing an opponent. Maybe the lack of competition all day left Joey’s senses a bit dulled. 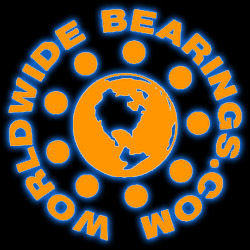 Williford nailed him to the tree with a .015 light (to Gladstone’s .091), and when Joey wheelied luridly at 100 feet it seemed all but over. Once the bike settled, though, Gladstone laid on the “Don King” button for extra boost, powering the DME Hayabusa to 207 mph at the stripe. 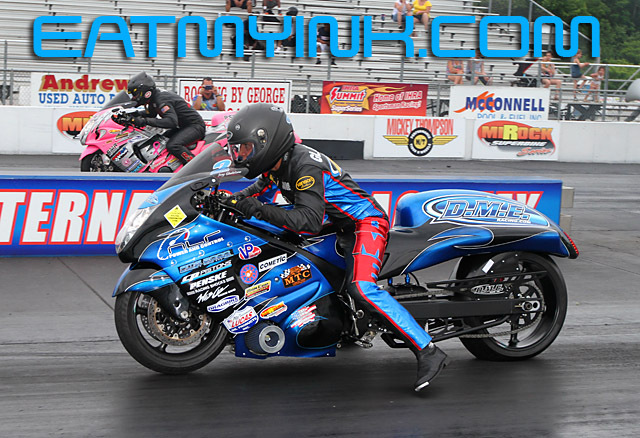 The heat of the day had Williford on and off the throttle in the other lane, but he kept up just enough momentum for a 7.28 to 7.26 holeshot win, some 13 mph slower than Gladstone. 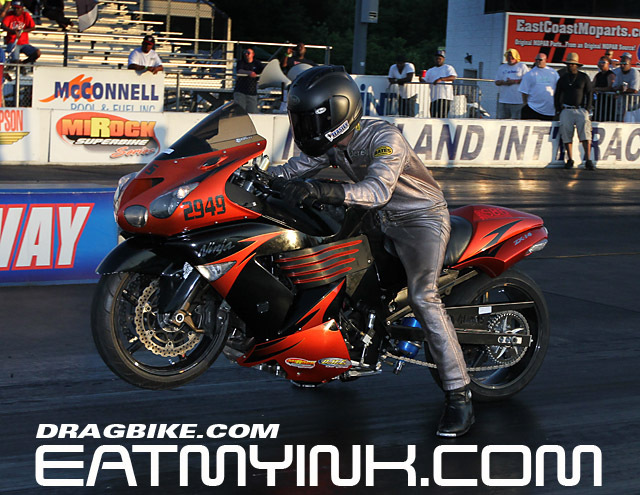 While the MIRock Pro Street season championship has boiled down to a two-man race, 40 of the world’s quickest, fastest streetbikes are expected to fight it out at MIR’s $10,000 Pro Street “Battle Royale” coming up in October—the season and place of the world’s first 6 second streetbike pass. Over breakfast Saturday morning, DME Real Street champ Johnny “Turbo” Dobrin voiced his concern that the class had become a competition-stifling two-bike race between his Exoticycle turbo ‘Busa and multi-time champ Jeremy Teasley’s Starrette owned and tuned, nitrous-huffing Kawasaki ZX14. No one bothered to tell Darion “Nanu” Payne that he and his Mike Mace Motorsports, nitrous Suzuki GSXR1000 weren’t players. His 7.85 slipped between number one qualifier Dobrin’s 7.83 and Teasley’s 7.86. Chris Moore wasn’t far behind with a 7.90 on another Starrette ’14. Moore redlit against Ed Murphy in round 1, and Payne raced Teasley for the right to face Dobrin in the final. Teasley took an advantage at the tree, but the big ’14 wheelied and Payne advanced. His nitrous bike made a huge move on Dobrin’s turbo to the 60 foot, but Team Mace threw too many pills into the stew and the 1000 wheelied wildly at halftrack. While Nanu feathered the throttle in mid air, Johnny Turbo drove around for the win. 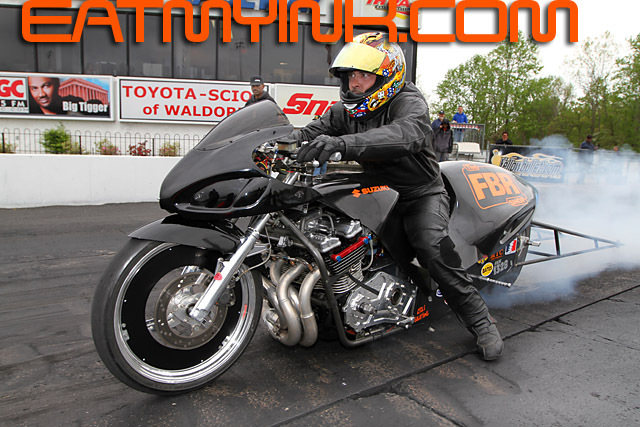 Bike Fest marked the return of Mickey Thompson Pro Mod and a condensed but elite field of eighth mile nitrous contenders. 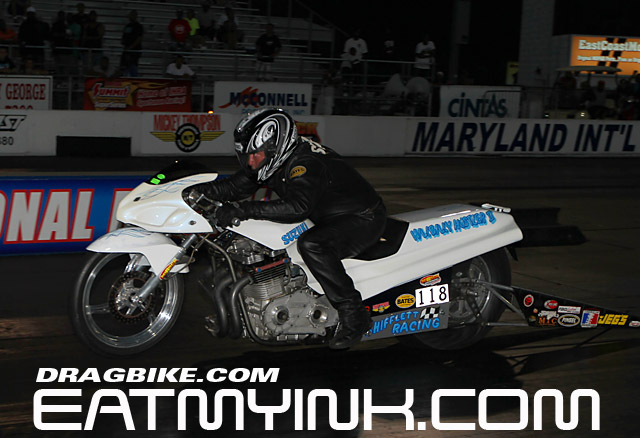 But Maryland native Ronnie Procopio showed that when it comes to MIR and the MIRock Superbike Series, nobody does it better. 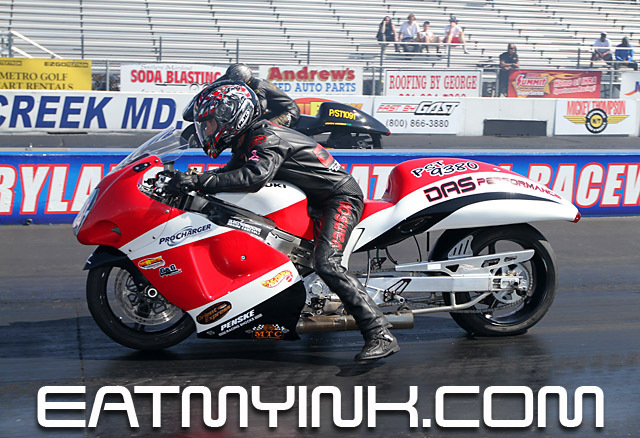 Procopio qualified number one with a 4.07 and stayed on top to take out fellow Marylander Dave Norris in the final. “Hillbilly Hustler” Jimmy Shifflett has been virtually unstoppable in 2013, taking home nearly every sportsman trophy in sight. Sunday he won Trac King/APE Top Sportsman. Shifflett’s .029 light beat up on Kelly Clontz in the final. Don’t feel sorry for Clontz. 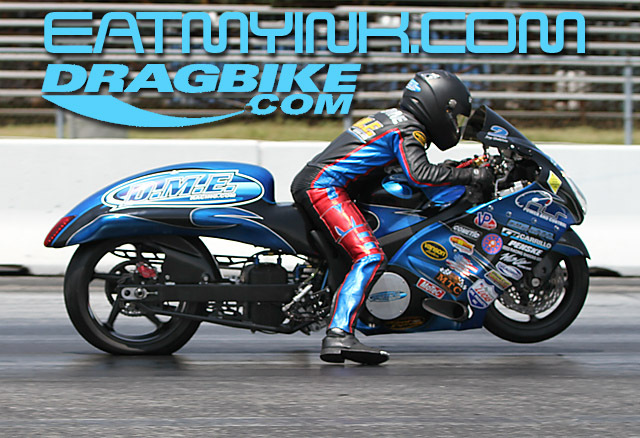 She took the all-lady “Paint The 1/4 Pink” breast cancer fundraiser race on Saturday, besting Julie Lucas in the final. Veteran racers Clontz and Lucas were the two quickest qualifiers for the bracket-run race. 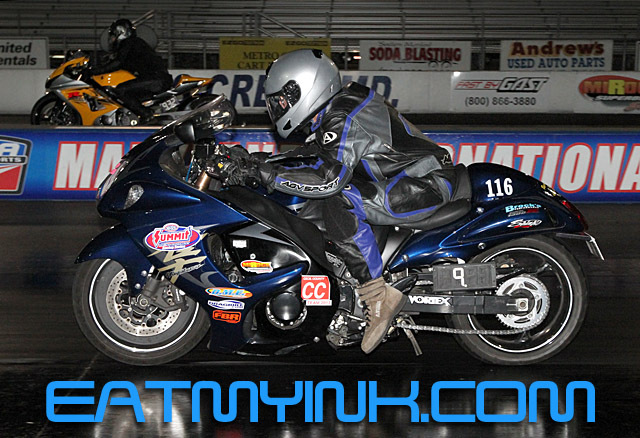 Kelly also won Friday night’s Gambler’s Race, and was still alive in Fast by Gast Pro ET when rained halted the event. Clay Davies drew high card amongst the remaining seven for the trophy and a spot in November’s Tournament of Champions at Rockingham. 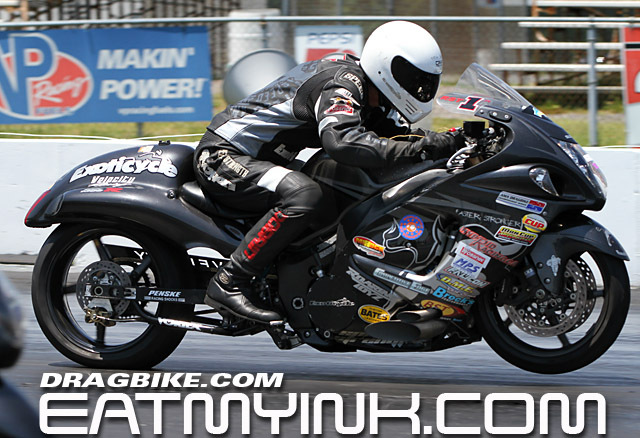 Jay Windsor won Saturday’s Pro ET final over Kelly’s brother-in-law Gary Clontz. Keeping it all in the Clontz family—sort of—Blair Buckler won Brock’s Performance Street ET on Saturday night wearing Chris Clontz’s leathers. Well, if Chris’ beaming smile and gleaming plate can’t be in the winners circle this time around, at least his suit can. 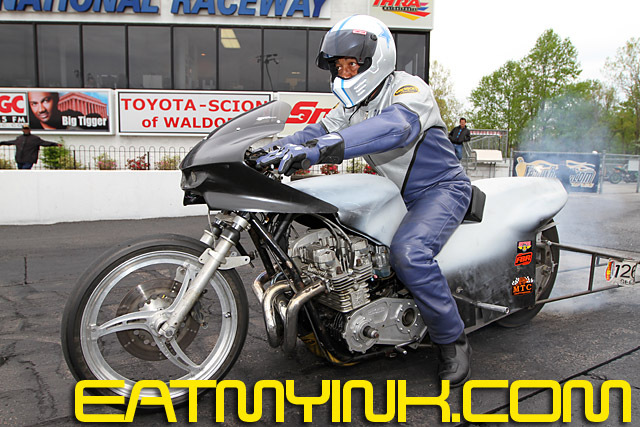 Buckler beat Bob Carlson in the final, a remarkable achievement for Connecticut racer Carlson, who raced one of Rickey Gadson’s school bikes while his own ZX14 is down for repair. Sunday’s Street ET race got nixed by the rain after four rounds. 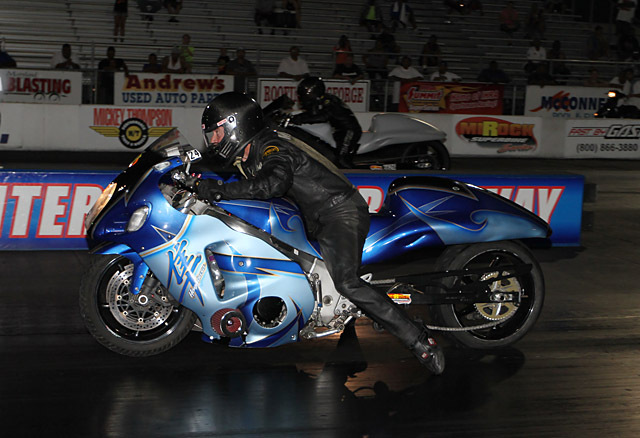 Two-time Rockingham Louis Concrete 4.60 eighth mile winner Kenny Cornnell added an MIR win to his résumé of the world’s quickest index bikes, beating May winner Ronnie Smith in the final. FBR Shop 5.60 made it all the way to the final pair before the rain, where class sponsor Marion Ford would have met Robert Parker. Parker was also still alive in MIRock Crazy 8s, as was “Fearsome” Andy Baumbach and MIR homeboy Shayne Proctor—who was plain Alive and Kicking. Shayne was aboard two entries still in Pro ET and was in Street ET as well. Last but certainly not least, Williford’s daughter Shyann took the Eatmyink.com Big Wheel race during track prep for Saturday’s rain delay. Shyann stayed in the pedals despite an overly optimistic tune-up, wild spinning wheelies and hairily torqued chassis to beat Jayla Minor in the final. Sound familiar? Saturday night’s Psychobike.com Afterdark Undergound was a lively affair, with Richard Gadson lapping frequently and scoring a few wins on the always-shining Bud Light Lime. The Cycles of Silver Spring East Coast Stunt Jam was the best wheelie, stoppie, drift and burnout event ever held at Bike Fest, highlighted by endo world record holder Jesse Toler showing how he does it for 1320 on MIR’s quarter mile. 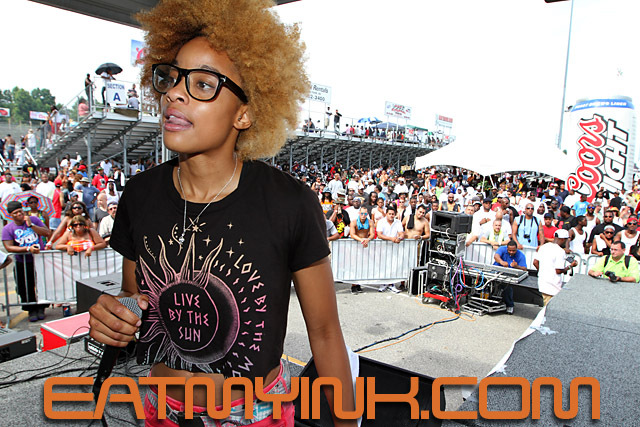 Up and coming R&B superstar Reesa Renee warmed up the crowd for the DC area’s absolute hottest bikini models and the International Bikini Team contest, MC’d and egged on by WPGC personalities DJ Flexx and Shack. Bikini bartenders dished out the Coors Light and the giant manufacturers’ midway showcased the latest in streetbike performance and bling technology. Speaking of bling, the blindingly glossy custom bike show delivered the lowest, fattest, most creative customs on the East Coast. 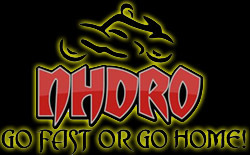 The Mickey Thompson Performance Tires MIRock Super Bike Series races next at the Dragbikelive.com Sportsman. 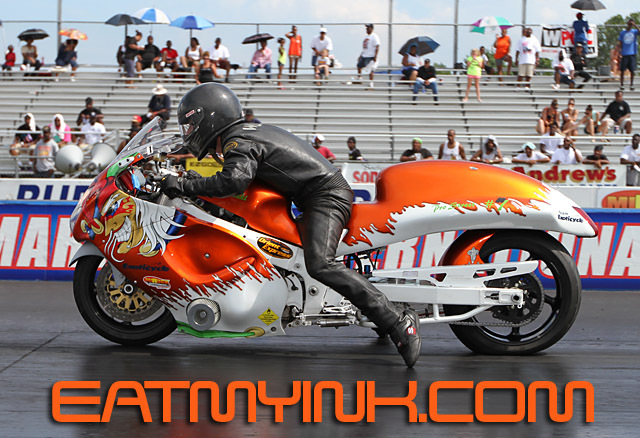 Baby it’s hot at Maryland International Raceway, but it always is at this time of the year. And those who work best in challenging conditions are rising to the top in qualifying. 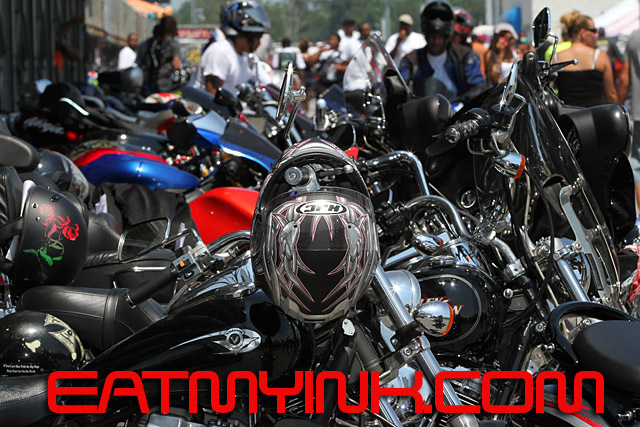 EARLIER: WPGC Bike Fest to set MIR on Fire! Jesse Toler will be making the trek to MIR all the way from Florida. 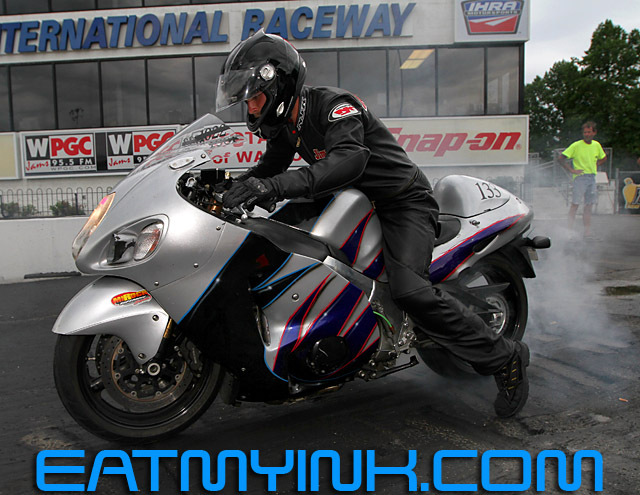 Toler holds the World Record for the longest stoppie on motorcycle, 1320.3 feet (402.42 meters). Toler and the top 3 competitors in the limited approach stoppie competition during the East Coast Stunt Jam at the WPGC Bike Fest will take to the 1/4 mile for a no holds barred stoppie competition on Sunday at 3pm.